This article speculates about a computer with a copy of Microsoft Word registered in Warren Flood's name possibly being used by Guccifer 2.0. Since this was article was published it has been discovered that Flood's name actually came from a document attached to one of John Podesta's emails. In my research to investigate the real identity of Guccifer 2.0, I discovered that the name Warren Flood applied to more documents than had originally been reported and highlighted the unusual nature of those documents both in terms of the metadata and the RSIDs (and Russian Stylesheet that existed in multiple documents even before the content in each document did) and explained that this demonstrates an effort to try to discredit Wikileaks by blaming leaks on Russian hackers. Considering where copies of Microsoft Word installed by Flood (highlighted in the photo above with Biden) might exist besides on computers he owns, I considered his past role as Sen. Joe Biden's Technology Director (as noted on his Linked-In profile) and thought one place to look for interesting activity would be computers residing in Biden's office or generally at the White House. So, I wondered who may have visited Biden that day around that time. 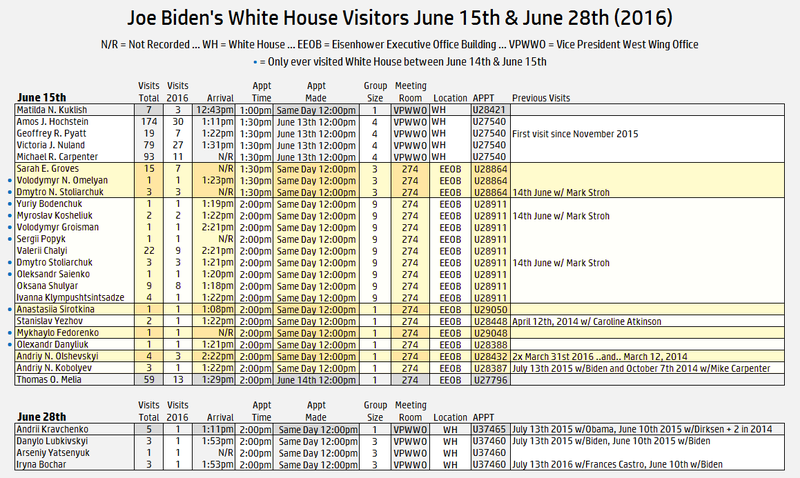 I thought I'd check out visits to the White House hosted by Biden, wondering whether there'd be any interesting activity anywhere near 1:38pm on June 15th 2016. 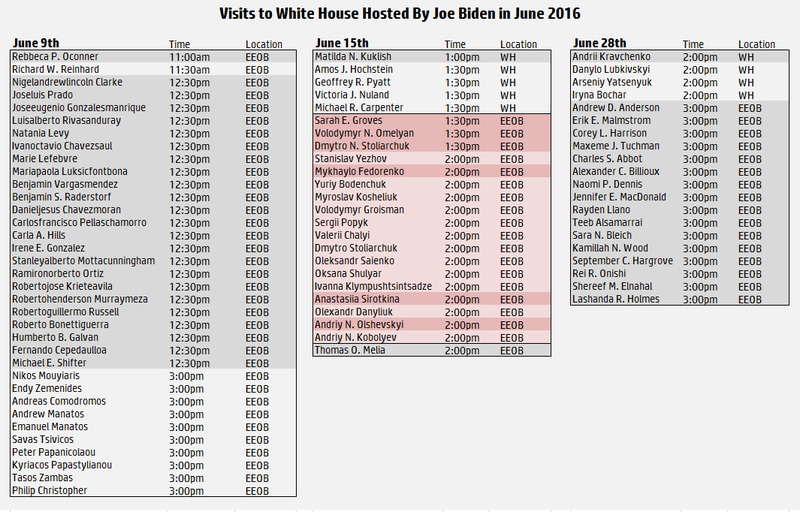 It turns out that Biden was hosting visits from a number of Ukrainians around that time, on that date. To see how frequent this sort of activity occurred I checked the whole of June. - It seems such visits were not a regular occurance. While this doesn't prove anything, it certainly is a curious coincidence to stumble upon while looking for activity of people that might have had a motive (or helped with an effort) to frame Russia. 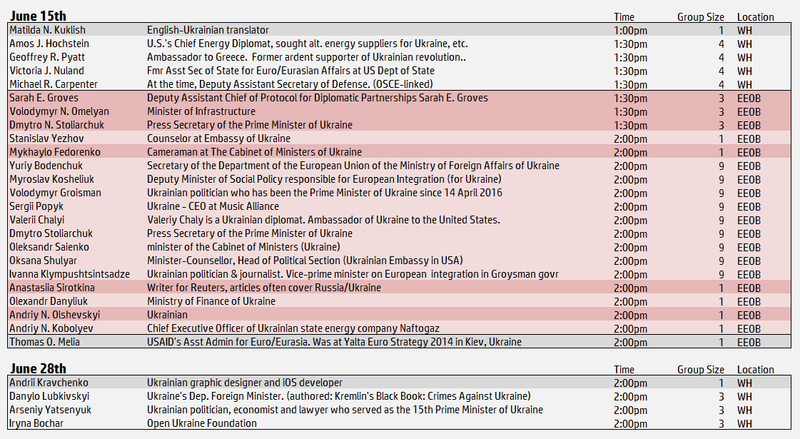 US visitors that day also have ties back to events surrounding the Ukrainian 2014 revolution and/or reporting on it (with the exception of Kuklish who is an English-Ukrainian translator) and most had worked or were working in the State Department. I'm not going to get into speculation. I've let journalists who have written extensively on the Ukraine coup know about this and will leave this up to them to pursue, if they wish to. UPDATE [May 2nd]: A closer look at the actual booking/arrival times, room numbers, other visits, etc. shows that, on the 15th, there were effectively 2 meetings. One of which had at least 18 individuals attending (Stoliarchuk is listed at 1:30pm and 2:00pm) and another with at least 4 attending.